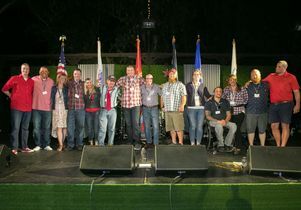 Operation Mend patients and a family members told stories of how it changed their lives during the stage presentation of the program’s 10th anniversary celebration. 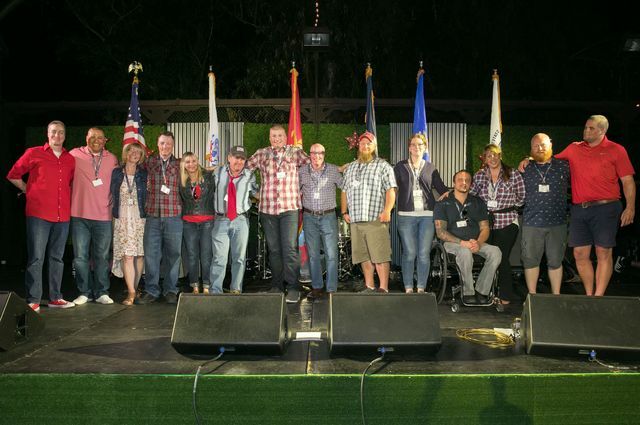 UCLA Health’s Operation Mend, a program for wounded U.S. veterans, celebrated its 10th anniversary at a Red, White and Denim-themed backyard party that raised more than $1.1 million to benefit the program. 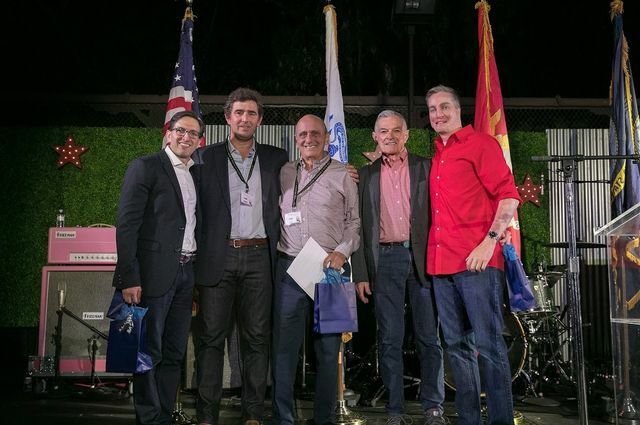 The celebration was held at the home of Operation Mend founder and philanthropist Ronald Katz on Sept. 24. Nearly 600 guests attended, including 53 veterans who have been treated through the program and their caregivers. Operation Mend provides free surgical, medical and psychological services to wounded service members injured in the line of duty after the Sept. 11, 2001, terrorist attacks in the United States. A highlight of the evening’s program was a series of 10 stories shared by Operation Mend patients and family members, one for each year of the program’s history. U.S. Army Sgt. Karolyn Smith, an Operation Mend patient who underwent a successful spine surgery at UCLA, told the audience that the program has helped her thrive. From left: Operation Mend’s founding members Amir Rubin, Dr. Chris Crisera, Ronald Katz and Dr. Timothy Miller are joined by Cpl. Aaron Mankin, the program’s first patient. Special recognition was given to Katz and the co-founding members of the team who helped build the program including: Amir Rubin, former COO of UCLA Health; Shannon O’Kelley, former associate director of clinical services and COO of UCLA Health; Dr. Timothy Miller, (retired) chief of plastic and reconstructive surgery at UCLA; Dr. Chris Crisera, professor of plastic and reconstructive surgery at UCLA and co-medical director of Operation Mend; Gen. James Amos, U.S. Marine Corps (retired) and Gen. Peter Chiarelli, U.S. Army (retired). Christina Geist, a New York City-based brand strategist, children's book author and entrepreneur, was a surprise honoree, recognized by program director Melanie Gideon for her ongoing work creating a broad network of support for Operation Mend on the East Coast. Willie Geist, host of NBC's ‘Sunday TODAY’ and co-host of MSNBC's ‘Morning Joe’ emceed the event. Fritz Coleman of KNBC-TV led the live auction and music legend Billy Idol and the Operation Mend All Star Band provided the evening’s entertainment. The event’s sponsors included the Thalians, the Katz Family Foundation, Karen and Russell Goldsmith, Steven and Laurie Gordon, Terry and Jay Snider, UCLA Health, Epic, Robert H. Lorsch Foundation, Bob and Marion Wilson, 7-Eleven, Inc., the Boeing Company, Laura and Jerry Gallagher, Christina and Willie Geist, Linda and Gary Ghazarian, Michele and David Glasser, Kayne Anderson Capital Advisors Foundation, Lenny and David Kelton, Jerry and Merle Measer and UCLA Athletics. 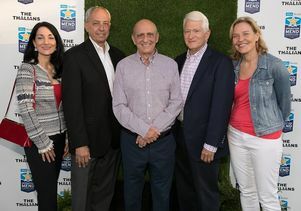 The money raised is part of the $4.2 billion UCLA Centennial Campaign, which is scheduled to conclude in December 2019 during UCLA’s 100th anniversary year. 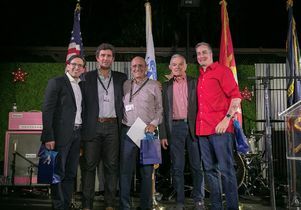 Founded in 2007, Operation Mend is a collaboration between UCLA Health in Los Angeles, the U.S. military and the Department of Veterans Affairs to help treat the wounds of war. Operation Mend provides advanced surgical and medical treatment and comprehensive psychological health support. It also offers advanced diagnostics and treatment planning for patients with symptoms of mild traumatic brain injury and PTSD through the Warrior Care Network, a collaboration between Wounded Warrior Project, UCLA and three academic medical center partners. Operation Mend is available to eligible warriors injured during combat operations or while training for service. All medical care, travel and accommodations are provided at no cost to participants and their families. To learn more or to donate, please visit www.operationmend.ucla.edu. Follow UCLA Operation Mend on Twitter at @Operation_Mend, on Facebook or on Instagram at @operationmend.